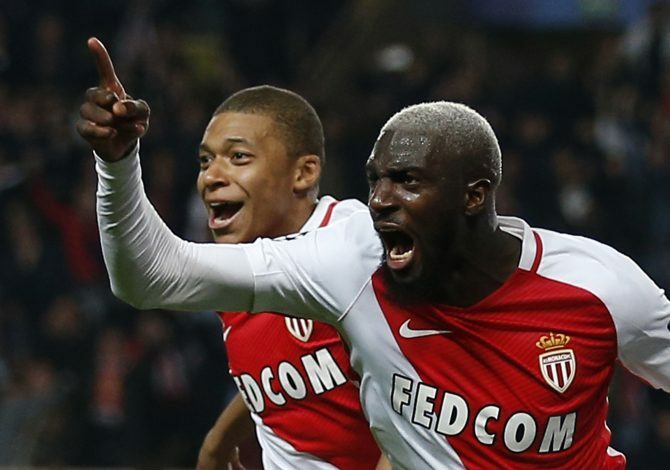 Liverpool and Manchester United have made enquiries for Chelsea target Tiemoue Bakayoko. The Premier League champions are expected to sign the Monaco midfielder with a £40m offer, but the entry of these two giants into the race might disrupt their plans. The Daily Mail reported that Liverpool, Manchester United, and Paris-Saint Germain have already made enquiries, but it is being widely rumoured that the Frenchman would be interested in joining Paul Pogba at Old Trafford in case his move to Chelsea breaks down. United are among the many European clubs interested in Monaco’s exciting youngsters, including Bernardo Silva, Fabinho, and Kylian Mbappe. The stock of all Monaco players has been on the rise since they lifted the Ligue 1 title and reached the Champions League semi-finals. Fabinho, 23, is rumoured to be pursued by Manchester City, whereas 18-year-old Mbappe is on the radar of Liverpool and Real Madrid. United realise the heavy competition they face for Bakayoko, though, which is why they have lined-up Chelsea’s Nemanja Matic as a backup target, the report adds. Tottenham’s Eric Dier has also been linked, though that move seems unlikely. Monaco are also preparing for an exodus from their history-making team. They are looking at Youri Tielemans from Anderlecht as one of the potential reinforcements, and contract extensions are also being offered to Radamel Falcao and Mbappe, as per sources.